The perfect team: Each of our trainers is fully capable of helping you to reach your health and fitness goals utilizing the GYROTONIC® and GYROKINESIS® methodologies. Every member of the staff at San Francisco GYROTONIC® has studied under Master Trainer, Debra Rose. Debra Rose is the founder and owner of San Francisco GYROTONIC®, primarily created to serve the San Francisco Bay Area's dance community in 1988. Since that time, San Francisco GYROTONIC® has grown to become one of the world's foremost GYROTONIC® training facilities, serving a variety of individuals and needs. Debra is not only a certified Master Trainer in all aspects of the system and equipment, but she is one of the few Master Trainers authorized by GYROTONIC® creator, Juliu Horvath to teach the GYROTONIC® Level I Final Certificate courses. As one of the first GYROTONIC® Master Trainers, Debra has worked closely with Mr. Horvath in developing and implementing a syllabus that has been used throughout the years and is responsible for training thousands of GYROTONIC® trainers currently working worldwide. Debra created the first syllabus and GYROTONIC® manual associated with a dance program for the LINES/Dominican University Bachelor of Fine Arts in Dance program. 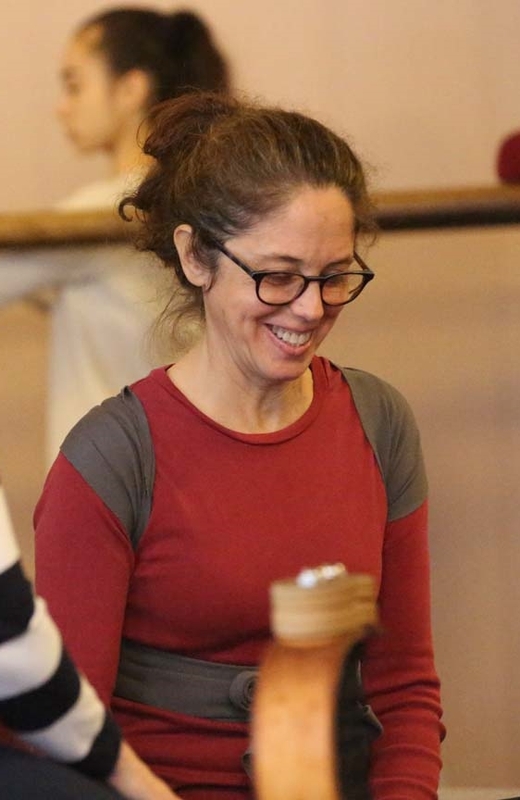 She has also created a unique GYROTONIC® curriculum for the Alonzo King LINES Ballet Training Program, Summer Program, San Francisco State University, and, most recently, The San Francisco High School of the Arts. Debra loves to help clients who have struggled with difficult injuries and limitations, who have not had success with other methodologies, and guide them towards their most healthy, strong, and mobile selves through the GYROTONIC® method. As a dancer, Debra trained in New York at The School of American Ballet, after which she danced with the Oakland and San Francisco Ballets. The majority of her career was spent dancing as a principal and founding member of Alonzo King's LINES Ballet for 20 years. In addition to being a principal dancer, Debra served as a Ballet Mistress for LINES and assisted Mr. King in setting choreography on various companies that include Alvin Ailey American Dance Theater, Dance Theater of Harlem, and the Joffrey Ballet. Debra also danced for the San Francisco Opera Ballet for 30 years, performing with artists such as Placido Domingo, Marilyn Horne, and Renee Fleming. She retired from the Opera in December 2013. Samantha Anton was first introduced to the GYROTONIC EXPANSION SYSTEM® by Master Trainer, Debra Rose in 2009 as a dance major with the Alonzo King LINES Ballet BFA Program at Dominican University. Samantha was the youngest dancer in the program to be certified in this system. She is also certified on various pieces of specialized equipment such as the Jumping Stretching Board, the Archway, and GYROTONER®. Samantha is certified in GYROTONIC® Level 2 and has taken specialized application courses to help work with pre and postnatal clients, professional dancers, and to gain knowledge of the structural integration of the body’s connective tissue. In dealing with many of her own dance related injuries, Samantha has found a way to heal herself completely using the GYROTONIC EXPANSION SYSTEM®. She has experience dealing with clients who have spinal weakness, hip girdle instability and pain, severe cervical spine tightness, postural displacements, insufficient movement patterns, and lack of range of motion. Samantha Anton is currently still dancing professionally with various choreographers in the bay area as well as Inside Out Contemporary Ballet. Roseann, originally from Long Beach, California, began studying the GYROTONIC® & GYROKINESIS® methodologies nearly 20 years ago. After suffering an injury that prevented her from dancing, she began to deepen her strength-training practice and rehabilitation under the guidance of Master Trainer, Alicia Head. With a deep gratitude for her training in the GYROTONIC® & GYROKINESIS® methods, she arrived at the BFA program at SUNY Purchase College. Invigorated with more physical strength, flexibility and awareness of her body than prior to her injury, Roseann learned the inherent benefits of the GYROTONIC EXPANSION SYSTEM®. Now, Roseann is a certified trainer in both the GYROTONIC® & GYROKINESIS® systems. She is certified on all of the GYROTONIC® specialized equipment and is a GYROKINESIS® Pre-Trainer. Roseann has also taken the GYROTONIC® Dancer’s Application course and GYROKINESIS® Essentials course. She is thrilled to be under the guidance of Master Trainer Debra Rose and is inspired by the passionate community of trainers at San Francisco GYROTONIC®. She looks forward to sharing with her clients the freedom, connectedness and physical consciousness that inspire this beautiful system. As a professional dancer, Nicole used both the GYROTONIC EXPANSION SYSTEM® and Pilates as a supplement to her training. In 2007, Nicole completed her GYROTONIC® Level 1 certification under Master Trainer, Debra Rose. She has continued to deepen her expertise of the work through continued education in the GYROTONIC® methodology and has received additional certification on specialized equipment with Master Trainers, Debra Rose, Tamara Yoneda, and Abel Horvath. She has also completed rehabilitative studies with Paul Horvath, Master Trainer and brother of GYROTONIC® creator, Juliu Horvath. She is also certified in the GYROTONIC® Level 2 programs and has taken the following workshops: Therapeutic Applications for Scoliosis, Therapeutic Applications for Pelvic Girdle, Applications for Shoulder Girdle, Principles in the Context of Osteopath, Explorations into the Extremes, and Psoas Principles. In 2002, she became certified in Pilates through The Physical Mind Institute under Jean Sullivan. She has studied with influential teachers Jean-Claude West and Mercy Sidbury in advanced concepts and teaching of Pilates. As a teacher Nicole draws on her extensive knowledge of the body in motion to facilitate her clients’ discovery of their own movement and flow. She has a strong interest and knowledge in alternative health and nutrition, which she graciously shares with her clients to complement her teaching. Clare Cleveland became a Certified GYROTONIC® Trainer in 1999 with Master Trainer, Debra Rose. She then studied with GYROTONIC® founder, Juliu Horvath to become a Certified GYROKINESIS® Instructor in 2001 and a Certified GYROTONIC® Pre-Trainer in 2003. She has been on the faculty of LINES Ballet/Dominican University since 2006, teaching GYROTONIC® and GYROKINESIS® to students in their BFA Program in Dance and teaches experiential anatomy for the LINES Ballet Training Program based on the Franklin Method® and the work of Tom Myers and Gil Hedly. She currently only teaches students in the school programs. Clare has a diverse background as a GYROTONIC® and GYROKINESIS® Instructor, Integrative Yoga Therapist, functional anatomy teacher, and has been a lifelong lover of dance. She has a BA in biology and psychology and over 20 years of experience in medical research for Stanford University Psychiatry and UCSF Department of Medicine. Her multi-disciplinary background enables her to work well with adults of all fitness levels, dancers, and those recovering from injury or with chronic conditions. She works to facilitate her clients' overall well-being by teaching them to re-pattern movement and postural habits, and improve body and breath awareness. Ultimately, she strives to help clients rediscover their connection to movement as a source of healing, energy, and joy. Charity Ellis is a certified GYROKINESIS® Pre­Trainer and GYROTONIC® Trainer who enjoys feeding the inspiration and body awareness of her students ­and clients who range in age from 8 to 80 years old. She has experience working with people dealing with trauma and anxiety, injuries , and scoliosis , as well as those who merely want to strengthen or otherwise expand their personal fitness. Charity is certified in the advanced work of the system and on most of the GYROTONIC® specialized equipment. She is also an artist with a background in languages, music, and dance – so movement, flow and rhythm have always played an important role in her life. She was a long-time student of ballet, tap, acrobatics, yoga , and kung fu before discovering her deep passion for GYROTONIC® and GYROKINESIS® methodologies. Marissa began teaching at San Francisco GYROTONIC® in 2017 after studying the system for four years in the LINES/Dominican BFA program. She uses imagery to make GYROTONIC® ideologies approachable, tangible, and functional for a variety of thinkers and movers. She has trained Olympic weight lifters, triathletes, and dancers; as well as non-athletes overcoming herniated disks, numbness in limbs, stiffness, or dormancy from taxing 9-5 office shifts. Marissa is also certified in the GYROTONIC® Applications for Juliu's Wrapping System. She has taught the GYROTONIC EXPANSION SYSTEM® to students in the LINES Ballet/Dominican BFA Program, LINES Ballet Training Program, and San Francisco State University Dance Department. Her knowledge was refined from studying under Master Trainers, Debra Rose and Alicia Head; as well as the endearing SFG faculty. Kaleena Hurlburt was drawn to the GYROTONIC EXPANSION SYSTEM® while dancing professionally because of the elegant manner with which it strengthens, mobilizes, and conditions the body. Since 2009, Kaleena has studied with Master Trainers, Nora Heiber and Elizabeth Dawson. She currently works extensively with studio owner of San Francisco GYROTONIC® and Master Trainer, Debra Rose. Kaleena is certified on all pieces of Specialized Equipment and both Level 2 Programs. She has also completed the following courses: GYROTONIC® Prenatal and Postnatal Applications, GYROTONIC® Applications for the Shoulder Girdle, GYROTONIC® Applications for the Pelvic Girdle, GYROTONIC® Psoas Principles, and GYROTONIC® Applications for Dancers. Additional GYROKINESIS® Certifications include: GYROKINESIS® Breathing Course Intensive, GYROKINESIS® Happy Moves Course, and GYROKINESIS® Lotus Blossom Program 1 Course. Maurya Kerr began GYROTONIC® sessions for her own body almost thirty years ago with Master Trainer, Magali Messac. She became a trainer at San Francisco GYROTONIC® in 2005 under Master Trainers, Debra Rose and Nora Heiber. She has also worked closely with Master Trainer, Hilary Cartwright in her GYROTONIC® Hip Replacement Workshop. Maurya is certified on all the specialized equipment and has extensive experience with dancers, clients with hip issues, and clients with Parkinson’s disease. Utilizing the GYROTONIC® system to rehabilitate from her numerous orthopedic surgeries, has made her well-equipped to help injured and non-injured clients alike rebuild their bodies and return to a feeling of physical empowerment. Yu Kondo Reigen, originally from Japan, completed both GYROTONIC® and GYROKINESIS® training with Master Trainer, Debra Rose and has been with San Francisco GYROTONIC® since 2011. Yu is certified on all of the GYROTONIC® specialized equipment. She has continued her training with therapeutic application courses including: pelvic girdle, shoulder girdle, psoas principles, Pre and Post Natal. Yu has also taken more advanced GYROTONIC® courses including Dancer’s Application and Level 2 programs. Since she joined the team at San Francisco GYROTONIC®, Yu has been working with a wide variety of clients including people with chronic pain and tightness, hip and knee surgeries, sciatica pain, spinal issues, shoulder injuries, dancers or athletes, and anybody interested in becoming more aware with their bodies. "I am thrilled to share the joy of connecting back to the true essence of power, freedom, and creativity through the GYROTONIC EXPANSION SYSTEM®"
Her movement background started with Hip-Hop and Japanese Festival Dance as a child. Yu has always been a passionate dancer/mover. Rita Scott learned the GYROTONIC EXPANSION SYSTEM® in her native Rio de Janeiro, Brazil, from Master Trainer, Rita Renha. She is also certified in the GYROKINESIS® methodologies, GYROTONIC® Level 2 programs, Jumping Stretching Board, and GYROTONER® with Master Trainer, Debra Rose. Rita specializes in working with dancers to aid in their cross training by leveraging her previous professional ballet career with the Teatro Municipal De Niter and the San Francisco Opera, her San Francisco Ballet School training, and the GYROTONIC® Applications for Dancers material. New clients from the global community will especially appreciate Rita’s international background and diverse cultural competency. Her goals are to welcome her clients, movers and non-movers alike, and lead them toward moving with ease, strength, and balance. Rita is a member of the faculty of the GYROTONIC® programs for the LINES BFA at Dominican University, the LINES Ballet Training Program, and the San Francisco School of the Arts. She also holds a Bachelor's degree in Psychology. Rita loves being part of the SFG team. Margaret Tappan is an avid and enthusiastic teacher of movement. A former professional ballet dancer, she began training in the GYROTONIC EXPANSION SYSTEM® in 1998 with Master Trainer, Debra Rose and GYROTONIC® inventor, Juliu Horvath. She has acquired certifications in the GYROTONIC® and GYROKINESIS® methodologies as well as all of the specialized GYROTONIC® equipment. She has a keen understanding of the dynamics of the human body, drawing from her dance background and her studies in experiential anatomy, biomechanics and neuromuscular re-education. She is especially interested in the therapeutic applications of the work and has completed Paul Horvath’s Shoulder Girdle, Pelvic Girdle and Scoliosis courses. Margaret specializes in correcting faulty posture and movement patterns, alleviating chronic pain in clients with special needs, such as scoliosis, sports and dance related injuries, and rehab from surgeries. Margaret feels that the GYROTONIC EXPANSION SYSTEM® is unique in that it assists people of all ages in achieving a strong, expressive and supple body. Ultimately, she aspires to bring the joy and ease of movement into people’s lives. Mariano Wechsler began his GYROTONIC® training at San Francisco GYROTONIC® under Master Trainers, Debra Rose and Nora Heiber and was certified in 2005. He is also certified in the GYROKINESIS® methodology, and on several pieces of specialized equipment including Jumping Stretching Board, Ladder, Archway, and the Leg Extension Unit. Over the past decade of teaching the GYROTONIC® system, Mariano has successfully helped clients in their recovery from herniated disks, strokes, and various surgeries. He has also successfully helped clients such as professional dancers, martial artists, marathoners, cyclists, soccer players, and football players looking to increase their performance. He received his BS in Exercise Biology from UC Davis. Movement has always been his life-long passion and he continues to explore and deepen his understanding to pass onto his clients and students. Joyce Zavarro started practicing at San Francisco GYROTONIC® in 2008 after recovering from minor surgery for spinal stenosis with the intention of maintaining and increasing flexibility and suppleness that the GYROTONIC EXPANSION SYSTEM® emphasizes. She fell in love with the system and how it complimented dance. Having been dancing for over 30 years while working as a graphic designer, the GYROTONIC® practice has given her a deeper understanding of how the body moves and how aging does not need to limit us. Joyce loves how it creates fluidity, expansion, and most of all well-being. The joy that this method brings is wonderful and she loves sharing the knowledge. Joyce is certified in the GYROTONIC® Level 1 and Level 2 programs and on the Jumping Stretching Board and Archway. She is grateful to San Francisco GYROTONIC® and honored to be part of the studio.